All experience the benefits of our gym gloves. Whether you're just starting in your fitness or are a professional athlete training for the upcoming season, these are for you. Extra grip from the silicone printing on the palm ensures that you can grip gym equipment with ease, perform better during workout. There are two easy pull off tabs in fingers, help you take off these gloves easily; and there is a towel in the thumb to wipe your sweat away. With the protection by the thick sponge pad on the palm, and the support by the wide and hard wrist wrap, your hand will far away from calluses and injury. " BENEFITS OF USING TRAINING GLOVES🚩- Besides the fact that they protect your hands from injuries providing comfort in every workout, these gloves for gym give you extra power by STABILIZING and SUPPORTING the wrists during heavy training. This fact leads to an improvement of the grip and more strength in lifting. 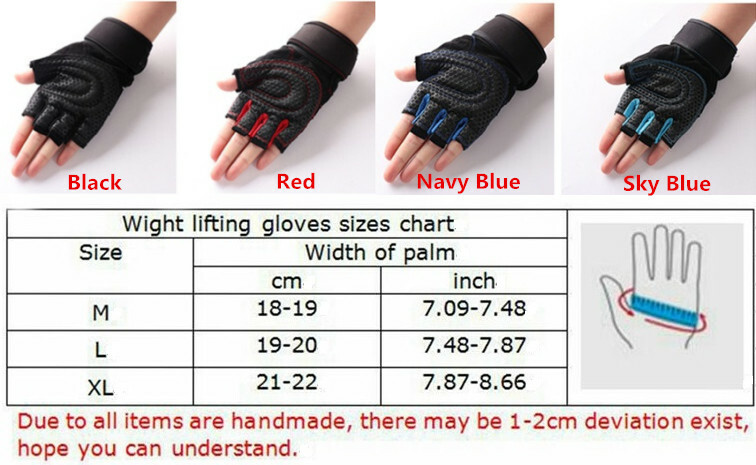 Muscles will be built faster using the weight gloves because they cancel the pain and blisters living you to concentrate on the correct form in every exercise.